MaxLight X Official Rectangular Notary stamps are some of the best stamps to own. Made with an eco-friendly process that uses much less power and reduces emissions, both you and your clients will be impressed with the quality impressions you will receive. The MaxLight X Official Rectangular Notary stamp will be handcrafted with your personal notary identification information and is guaranteed to meet all state board specifications. The dual spring technology and extra large inkwell makes this notary stamp a work horse. Unsure if the MaxLight X Official Rectangular Notary Stamp is the best option for your needs? Contact us! As a notary public, have you ever run in to a heavily-worded document that barely has enough room for your notary stamp or seal? We realize this is a common problem for notaries all over the United States, and that is why we created the MaxLight X Official Rectangular Notary stamp. The MaxLight X Official Rectangular Notary stamp can easily produce an impression within the margins of a lengthy document. 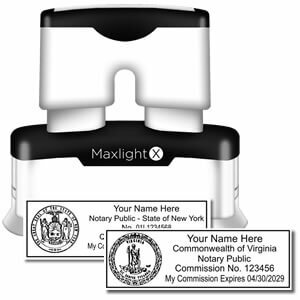 With minimal pressure needed to produce a quality impression, the MaxLight X Official Rectangular Notary stamp is a great product for all notaries but especially those with heavy workloads and who run into lengthy and crowded documents.